The need to keep Far Cry 3 "engaging" led the designers to seek ideas from some unexpected sources. Most shooters are relatively linear experiences. You shoot some guys, move to the next bit, shoot some more guys, wash, rinse and repeat. Open world shooters face a different challenge: letting players go places and kill things without arbitrarily slaughtering them for wandering into the wrong areas or allowing the action to slip into routine or drudgery. Some sense of balance and progression has to be maintained. 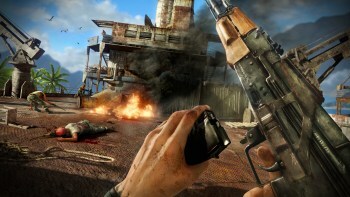 "We've had to take a little bit of a different approach to most shooters," Far Cry 3 lead designer Jamie Keen explained at the Eurogamer Expo. "In order to keep a player engaged over a period of time there are certain other genres we have to look into to keep that engagement over a longer time. So we've been looking at things like MMOs, we've been looking at other open world titles. The Elder Scrolls series is a huge inspiration for us; games like Red Dead [Redemption] and other Rockstar games as well." To make up for the relatively limited ways that players can interact with the world and its characters, Keen said Far Cry 3 will offer more than 250 "encounter types" and track which ones you've had recently, so you won't see the same thing repeatedly. "It's important too that you feel like the world isn't - we don't want you to feel like, 'Oh it's this encounter again, I've seen this one'. You know, 'Arrow to the knee', for example," he said. "While the 'arrow to the knee' thing is actually quite cool, we don't necessarily want that." "You end up with this real feeling of diversity of things going on," he added. "And you will see the same encounter again, but hopefully there's enough of them that you won't remember it, probably."